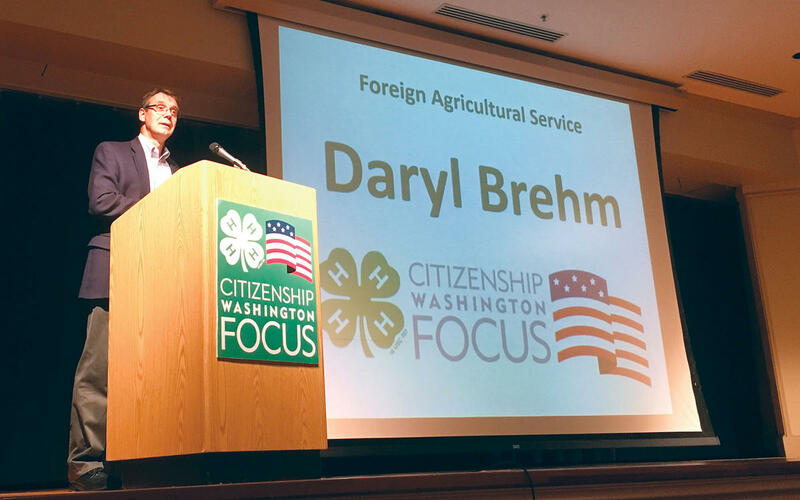 Retired FSO Daryl Brehm speaks at the national 4H conference center in Chevy Chase, MD. Welcome to AFSA's Speakers Bureau information page! AFSA offers a speaker placement service free of charge for anyone interested in hosting an active-duty or retired member of the Foreign Service to speak to their group. We place no restrictions on the size of groups, as our speakers have in the past presented to groups as small as book clubs and as large as universities and World Affairs Councils. AFSA does not charge for this service; however, the speaker may accept modest honorariums if offered, and assistance with travel or overnight lodging expenses. If you are interested in requesting a speaker through AFSA's Speakers Bureau, please fill out our online form. We will gladly provide contact information for Foreign Service speakers who reside in your area. Our frequently asked questions may be of help or contact AFSA’s Outreach Department at (202) 338-4045 ext. 705 or via email at speakers@afsa.org with any additional questions. If you are a Foreign Service employee or retiree who would like to register for the Speakers Bureau, please fill out our online form. Our frequently asked questions may be of help or contact AFSA's Outreach Department at (202) 338-4045 ext. 712 or via email at speakers@afsa.org with any additional questions. Once you confirm a speaking engagement, be sure to request your free copy of Inside a U.S. Embassy by clicking here. Let AFSA know where you've been speaking! If you are a Foreign Service employee or retiree and have been speaking about the Foreign Service in your community, please fill out this form to let AFSA know about your speaking engagement(s). We will use this information to track the number of events in support of the Foreign Service each year, as well as to collect data on regions, audiences, and topics.